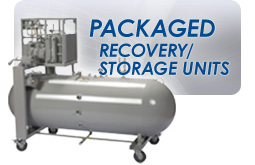 The horizontal compressors offer the largest capacity of any of Corken's compressor lines. This line of compressors can be used for unloading tankers or multiple railcars, wellhead gas recovery, pressure boosting, and gas blanketing. 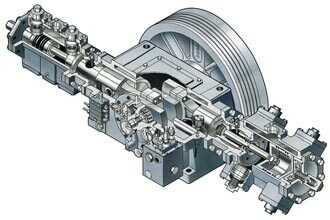 The modular design of the horizontal compressor allows for various combinations of cylinder sizes with up to 4 stages of compression. Corken currently offers 8" (203.2 mm), 6" (152.4 mm), 5" (127 mm), 4" (101.6 mm), 3¼" (82.6 mm), and 2¾" (69.9 mm) cylinders. Most of these cylinders are available in a water-cooled version. Various other options such as variable clearance heads, corrosion resistant coating, and external crankcase oil cooler are also available. Custom-engineered skid-mounted units can be supplied with control panels, wiring, ASME code liquid traps and other special accessories as required. Due to the versatility of the various cylinder combinations, the horizontal compressors provide a full range of capacities up to 414 cfm (703.5 m3/hr) with maximum working pressures of up to 4,500 psig (310.3 bar).